Sweet Itch in horses - would a natural remedy help? 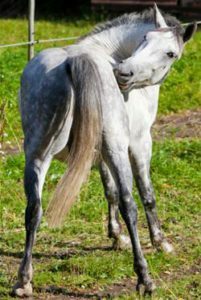 Sweet Itch in horses – would a natural remedy help? Invest in one of those sweet itch rugs to prevent further bites. Feed one cup of Linseed or Chia seeds for the Omega oils, which have been found to help Sweet Itch in horses. Contrary to popular opinion, you can feed Linseeds whole, unsoaked and uncooked. In an allergy, the very first thing that happens is that the horse’s body reacts to the allergen (Culicoides saliva) by making mast cells burst open and release histamine (which causes redness and itching) and cytokines (which cause inflammation). Amazingly, the best way to halt this reaction in its tracks is to use various natural substances – Spirulina, Citrus Bioflavonoids, Rooibos, and Vitamin C. These natural substances work better than any drug on the market to stabilise the walls of the mast cells, preventing the release of cytokines and histamine. This, in turn prevents the swelling, itching and redness. Certain minerals, if deficient in the diet (and this is not uncommon), can cause your horse to be more prone to developing allergies such as Sweet Itch. These minerals are Magnesium, Copper and Zinc. So, I’ve added them here, in a bioavailable form, to make sure that a deficiency doesn’t happen. One of the biggest problems with Sweet Itch is that the horse becomes insane with itchiness and will scratch to the point of bleeding. These sores then often become infected, making the whole problem even worse. Echinacea purpurea helps the white blood cells get rid of disease causing bacteria. It does this by literally increasing the ability of phagocytes to ‘swallow’ foreign bacteria. Mazur, Andrzej, et al. “Magnesium and the inflammatory response: potential physiopathological implications.” Archives of biochemistry and biophysics 458.1 (2007): 48-56. Theoharides, T. C., et al. “Stress-induced rat intestinal mast cell intragranular activation and inhibitory effect of sulfated proteoglycans.” Digestive diseases and sciences 44.8 Suppl (1999): 87S-93S. Rolla, G., et al. “Reduction of histamine‐induced bronchoconstriction by magnesium in asthmatic subjects.” Allergy 42.3 (1987): 186-188. Kraeuter, Sandra L., and Ruth Schwartz. “Blood and mast cell histamine levels in magnesium-deficient rats.” The Journal of nutrition 110.5 (1980): 851-858. Bélanger, L. F. , Van Erkel, G. A. , and Jakerow, A. , Science, 126, 29 (1957). Bois, P. , Byrne, E. H. , and Bélanger, L. F. , Canad. J. Biochem. Physiol., 38, 585 (1960). Stark, G., B. Schneider, and M. Gemeiner. “Zinc and copper plasma levels in Icelandic horses with Culicoides hypersensitivity.” Equine veterinary journal 33.5 (2001): 506-509. Kim, Hyung-Min, et al. “Inhibitory effect of mast cell-mediated immediate-type allergic reactions in rats by spirulina.” Biochemical Pharmacology 55.7 (1998): 1071-1076. Yang, Huh-Nam, Eun-Hee Lee, and Hyung-Min Kim. “Spirulina platensis inhibits anaphylactic reaction.” Life Sciences 61.13 (1997): 1237-1244. Mao, T. K., J. Van de Water, and M. E. Gershwin. “Effects of a Spirulina-based dietary supplement on cytokine production from allergic rhinitis patients.” Journal of medicinal food 8.1 (2005): 27-30. Melchart, D., et al. “Results of five randomized studies on the immunomodulatory activity of preparations of Echinacea.” The Journal of Alternative and Complementary Medicine 1.2 (1995): 145-160.